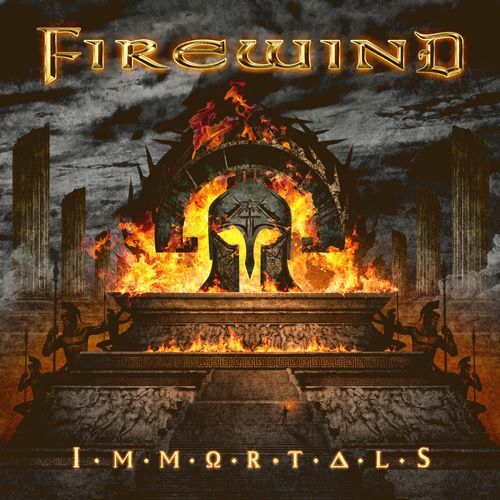 After five years since Firewind’s previous release, Few Against Many, the Greek Power metal band returns in epic fashion with the release of their eighth studio album, Immortals. Since the release of Few Against Many in 2012 all members of the band have been busy with various activities. Guitarist Gus G released two solo studio albums and toured worldwide to support those releases, as well as toured with “The Prince of Darkness” Ozzy Osbourne since 2009. Firewind already returned to the international live circuit throughout the past few months, but the band is excited for the release of Immortals in early 2017. “The songs were written in a much slower pace this time, as it’s the longest break we ever took between albums. So, we took our time writing this and concentrated on keeping ideas that were really strong,” says Gus G.
Immortals contained many firsts for the band, the album marks the first time that the band used an outside co-producer, with Dennis Ward, who engineered, mixed and mastered the album. He even had a hand in the writing process of the album. The new release also includes a new frontman with Henning Basse, who already performed with the band across the world in 2007 following the release of Allegiance. The 10-track energetic album, will have you wanting more after the 44 minute run time comes to an end. I have to be honest, I’ve listened to it about 4 times before I sat down to write this review because I enjoyed it so much. Combining elements of power metal, symphonic metal, mixed with some amazing technical instrumental abilities, fast paced guitars, heavy double bass punching drums and strong vocals, Immortals will have you prepared to ride into battle. Inspired by tales of the Spartans defending against the Persian army, the story that lead to the creation of the film ‘300,’ this epic album hits on all cylinders. The highlight of the album for me personally was the entire release itself, I honestly cannot find anything I didn’t like about it. Be sure to get your copy of this masterpiece of Power Metal when it’s released on January 20th, 2017.